Heading into this season, the common refrain around the Kootenay Ice was “well, at least it can’t be any worse than last year.” In 2015-16, the Ice finished dead-last in the WHL and had a negative 84 goal differential with a 12-53-6-1 record. So far, the adage that the team’s already hit rock-bottom has wrung true — but barely. While the Ice call-up only accrued 20 points in the standings after 36 games — half the season — they’re six points ahead of where they were at this point in 2015-16. Also, unlike last year, they aren’t in last place in the league. The Prince Albert Raiders are four points behind Kootenay with 16 points in only one less game. Still, there isn’t a whole lot for fans to be thrilled about. With only 6 wins, the Ice are matching their rate from last year, and with only 3 of those — as opposed to 5 a year ago — coming at home, there have been fewer chances for the Cranbrook faithful to cheer. Although the team has picked up considerably more single points from overtime and shootout losses, at this point the playoffs still seem like a far off dream for the Ice. As the team enjoys its holiday break, here at the Townsman it’s report card time. Forwards: Up front, the Ice are just about as top heavy as you can get. Over half of the team’s goals to this point, have been scored by just three players. The top forward line of Matt Alfaro (10 goals, 14 assists), Vince Loschiavo (12 goals, 8 assists) and Zak Zborosky (23 goals, 14 assists) have been dominant. They’re a threat every time they’re on the ice and even though every team knows it, they’ve continued to produce steadily. But who else have they got? Cale Fleury has shown he can make some things happen — especially when the other team’s net is empty — and Barrett Sheen has muscled in a few, but outside of the big three, the Ice’s offense is pretty feeble. Defence: D-man Cale Fleury may be the only current Ice player expected to be drafted into the NHL this summer, but so far the Ice’s backend has been in trouble. It mostly, however, comes down to a lack of experience. While Fleury and Troy Murray are veterans now, their bottom four started the year lacking experience. Sophomores Ryan Pouliot and Dallas Hines have shown potential, as have rookies Fedor Rudakov and Sam Huston, but they still need time to find their way. The long-term injury to Russian import Nikita Radzivilyuk was a blow, but the recent addition of 19-year-old Kurtis Rutledge should help moving forward. No one has stood out as being especially bad on the blueline, but almost every defenceman has displayed a level of inconsistency and a lack of chemistry that is hurting the team. Goaltending: Despite the Ice giving up the most goals in the WHL, their goalie is a strong candidate for team MVP. Payton Lee has time-and-time again stood on his head for Kootenay and given them a chance to win nearly every game he starts. Unfortunately, Lee appears to struggle slightly in games where he’s not being peppered with the puck. While he made 55 saves on 57shots in a win against Portland, he let in 5 goals on 17 shots to Kelowna. After surprisingly beating out last year’s backup Declan Hobbs for the number two role, 17-year-old Jakob Walter has served admirably as backup. While he only has one win, he’s shown his worth and his poorest performances have mostly been the result of being hung out to dry by his teammates. Special Teams: As coach Luke Pierce once said this season, ‘the special team haven’t been too special’ Although their penalty kill has been respectable for long stretches throughout the season, their power play’s frequent struggles have been head-scratching. With players as talented as Zborosky, Alfaro, and Loschiavo to work the puck around and shoot, and a quarterback like Cale Fleury, it seems like man-advantage goals should be automatic. But just like they’ve struggled in 3-on-3 overtime, the top unit sometimes cracks under pressure and there just aren’t enough alternate options. Rookies: With the veterans clearly leading the team, the freshman have been almost entirely relegated to being energy guys — and they’ve actually done a pretty good job of it: 18-year-old Rudakov has been a versatile two-way defencemen, Sam Huston’s been reliable, Reed Morison’s shown flashes of his talent, and Jake Elmer has been truly explosive since joining the lineup in November. The guys to watch though have been the ‘mattress line’ of Keenan Taphorn, Kaeden Taphorn and Michael King — twins and a king — who have been key players in big moments. While Kaeden has been held out of the majority of games so far with unfortunate injuries, Keenan and King have matched up against some other teams top lines and provided massive hits and excitement. In Kaeden’s absence, fellow rookie Tanner Sidaway often suited up alongside them and his tenacious play has further shown that the rooks are all heart. Coaching: When Luke Pierce signed on to coach the Kootenay Ice last year, he knew that it was not going to be an easy job. The 33-year old bench boss inherited a very young and inexperienced team and despite his failure to advance them too much further in the standings at this point, he has done an admirable job of having them buy into a system, while keeping a fun atmosphere in the dressing room. Although there were a few games before the holiday break that were reminiscent of the ugly 2015-16 season, for the most part Pierce’s team has been extremely competitive. In their four meetings with the top-in-the-CHL ranked Regina Pats, Kootenay took them to overtime three times and even handed them one of their 8 losses. Pierce constantly preaches patience and if the team continues to listen, they should develop into contenders soon enough. Peyton Krebs: The silver-lining to last year’s dismal campaign was the Ice’s opportunity to draft first in the 2016 Bantam Draft. Although their selection, Peyton Krebs, is a can’t miss blue-chipper, as a 15-year old he’s only eligible to play five games for the Ice this season until his Midget AAA team’s season and playoffs are complete. Although Krebs has only suited up for the Ice three times back in November, he left a big impression on all those watching. In his first game, a 4-1 win in Lethbridge over the Hurricanes, he had the primary assist on Zborosky’s winning goal. Despite being five years Zborosky’s junior, Krebs’ performance in his first call-up to the WHL showed he’s already approaching even greater levels of stardom. Overall: Despite the disappointing record, the Ice have a few bright spots on their roster. 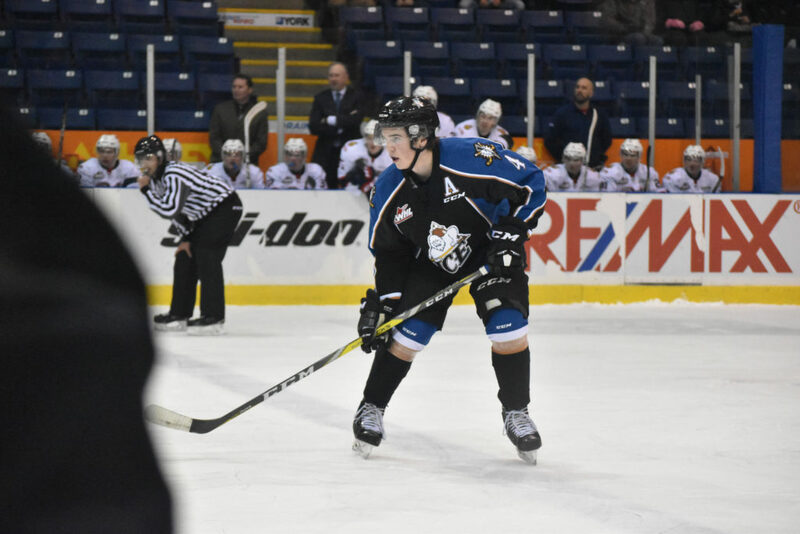 Although many of them are 20-year-olds who are on their way out, they may be able to lead Kootenay to a respectable closing half of this season, and then the tenacious first-years and their electrifying prospects should make them a team to watch for the future. Zak Zborosky is recognized for his consistent placement within the top goal scorers in the WHL. Although he is in fifth right now with 23 goals, he has often found himself at the top so far this season. Matt Alfaro is recognized for his end-to-end rush against the Swift Current Broncos on November 26. The goal was a thing of beauty and showcased exactly what he has been able to do for the team on a consistent basis. Vince Loschiavo is recognized for his brilliant seven-game goal-scoring streak in December. Cale Fleury is recognized for his fantastic double empty net goal night against the Lethbridge Hurricanes on November 16. Jake Elmer is recognized for his amazing Cranbrook debut on November 23 in which he got his first career assist, and won the game in the fourth round of the shootout. Luke Pierce is recognized for putting Elmer out in that shootout, and then explaining to the media that he ‘just thought it would make a good story.’ It did, thanks Luke!